I’ll never forget the morning I first laid eyes on him. It was a cool February morning and I was furiously chatting with my newly labeled ex-boyfriend, who broke up with me the previous night after a Dave Barnes concert—yes friends, you did read that right. I left my Old Testament class early that morning because it was becoming pretty obvious to everyone around me that my angry typing wasn’t note-taking. So I walked downstairs to finish our chat conversation in the unoccupied, drafty lobby of the administration building. I was still in my pajamas with my hair pulled up in a messy bun, and was really just killing time arguing with this guy about a relationship that I already knew was over—and to be completely transparent, could care less about. It’s funny thinking back now how hard I fought, despite the confirmation I had deep down that our break up was pivotal to the relationship break through the Lord was preparing me for. I heard the doors swing open and felt the warm sun hit my face, as I heard a familiar voice call out my name. I looked up and saw a friend I met earlier that semester walking into the admin building, and right there behind him was a guy I had never seen before. He was very tall and slender, and his brown hair curled out from under his Yankees hat. He started toward the offices after holding the door for two of the older ladies who worked there, when my friend already walking toward me, yelled for him to follow. As he walked toward the bench I was sitting on, my friend spoke up, “have you met Bordeaux yet?” I answered with a simple “no” as he reached out his hand to shake mine. I watched his wide smile reach up to meet his deep brown eyes, and when he looked at me I was filled with an instant sense of comfort. He stood there that morning talking and joking with me like he had known me for years. And it was in that moment, in the middle of an average Wednesday, a friendship was born that would eventually transform into the beautiful relationship we share today. My marriage, like so many others, is far from perfect. We get on each others nerves, we fight, we disappoint each other, and some days we just really don’t like each other. I believe the reality is, a successful marriage is not one without fights or failures, but one based on a faithful friendship. My husband and I spent almost a full year developing our friendship, before realizing we both wanted something more. That year provided a safe space for learning each other and spending time together without expectations. Our friendship laid an ideal foundation for the Lord to prepare Chip’s heart to pursue mine. We have weathered some pretty intense storms since that first year, but even when we failed in loving each other well, our friendship cushioned the fall and pushed us to fight for each other and the marriage God gave us. I have several single friends who have recently shared with me their desires to have a successful marriage one day, but because of society’s outlook on marriage, are unsure and often even fearful about what their marriages will look like. In our conversations, I have tried to encourage them with a few things I’ve learned and experienced in my marriage, and my hope is that I can do the same for you as you read these words today. A successful marriage, in my opinion, is the result of two people who actively pursue Jesus and enjoy spending time together—who make a covenant with God and each other to spend the rest of their lives having fun, sharing dreams, encouraging each other, and doing life together. Mine and Chip’s marriage hasn’t always been pretty—it’s actually gotten pretty ugly at times. But because it was rooted in Jesus and based on a friendship, our relationship has grown deeper through our hardships, instead of being destroyed by them. One of the most important things that I have learned in the last five years is that once the newlywed dust settles and everyday life kicks in, marriage requires sacrifice. And in order to be in a place to sacrifice, you have to first be spiritually and emotionally healthy. Unhealthy dating relationships lead to unsuccessful marriages filled with unrealistic expectations. Is this person someone who is genuinely pursuing my heart, or is it just a comfortable relationship? Would this person still desire a relationship with me if I were to remove the physical aspects of it? If I share the most real, raw, unfiltered version of myself are they likely to extend grace, love, and forgiveness; or judgement, critique, and resentment toward me? Do I feel safe giving this person my past struggles, current stresses, and future goals to carry with me? Is this person challenging and encouraging me in my faith or am I “carrying them” or trying to “fix” them? Can I see myself growing old with this person? Does that thought excite me or does it flood my mind with insecurities about whether or not we will stand the test of time? How does this person treat other people who are important to me? Do they share the importance of time spent with my family and friends or am I having to talk them into hanging out with my people? Is this person moving forward in their spiritual, emotional, social, and physical aspects of life or does it seem they are at a standstill, or worse…moving backward? If we are being really honest with ourselves, these questions should be pretty easy to answer. The challenge is found in the difficult decisions you may be prompted to make after answering them. The Lord wants us to enjoy marriage and ultimately established it to be a vehicle for ministry in growing closer to Him and encouraging others to do the same. He should be getting more glory out of the story we are writing together, than he ever did from us when we were apart. I can honestly say that my husband and I have been far more effective in ministry together, than we ever were when we were on our own. I write this not to discourage you, but to help you see that Jesus really does want more for you than you could ever want or dream for yourself. God promises that He is able to “do immeasurably more than we ask or imagine, according to His power that is at work within us” (Ephesians 3:20). I look back on every dating relationship I was in throughout the years and I am confident that not one of those guys would have stood by me, encouraged me, challenged me, and loved me the way that Chip has. At the end of the day, we have fun together and I know that no matter what storms we may face ahead that we will walk through them hand-in-hand, and I can trust that the Lord will equip Chip to lead me out to the other side. My husband isn’t perfect—but he leads me in a way that allows me to better see who Jesus is, instead of obstructing my view of Him. Purpose is a word we hear so often in church language. My pastor often says we were made on purpose, with a purpose, for a purpose. If you’re anything like me you love hearing that there is some great destiny that lies ahead, and that our lives could have a lasting legacy. But all to often we hear that on Sunday, and then Monday morning awakes us with a screaming baby, a coffee spill, or our gas light coming on when we are already running late for work. All my life I have felt a deep burning in my heart to do something big. As a little girl, I wanted to hand out stickers to people walking into Walmart. During my teen years, I dreamed of attending law school and then working for state government. In college, I changed my major three times and ended up pursuing a field completely outside my actual degree, but that’s another story. Today, as a 28 year old wife and mom, I have aspirations so big that I’m afraid to even whisper them out loud. I wonder why it’s ok for a little girl to dream, but when she becomes a woman that dream is met with shame and dismissal? I am a promise, I am a possibility. I am a promise, with a capital “P”. I am a great big bundle of potentiality. And I am learnin’ to hear God’s voice, and I am tryin’ to make the right choice. I am a promise to be, anything God wants me to be. What a cute little girl right?! A little girl who isn’t afraid of what people think, who will stand in the middle of the grocery store and sing this song loud and clear, a little girl who believes those truths with everything inside her. A little girl who now wakes up every morning wondering if she still has permission to sing that very song. Earlier this year I began wrestling with why God continued testing my faith. You see after struggles with my marriage, the pain of infertility, ups and downs of an adoption journey, and now a calling that is bigger than I feel is possible, I was pretty frustrated with why I have to keep walking through these things. One night as I was driving home listening to the radio, I actually screamed out a pretty ugly prayer, “how many times do I have to prove myself to you?” And in that very moment I was met with this realization—We may fight and win battle after battle after battle, but the war isn’t won until we surrender our strategy. You see I have walked into a hopeless situation and surrendered to the Lord’s plan, with the mindset that once I got through it life could go back to normal. Normal isn’t something the Lord calls anyone to. So that night as I drove in silence I knew the one thing he was asking me to hand over was that idea of my comfortable, normal, easy life. I had held on so tightly to the security of my plan for almost thirty years and quite frankly my hand was starting to hurt. So this next season of my life is going to be an interesting one. A time where I’m going to step out knowing that there’s no such thing as an average, comfy, routine-run life in my future. An opportunity for a 28 year old to belt out “I am a promise” at the top of her lungs with the same belief she had when she was only 3 years old. Jesus has called me to something far greater—and I am meeting Him there with anticipation. I want to challenge you to do the same. Overwhelmed. That’s my current season. Being busy doing good things doesn’t justify failing at the few things Jesus has called us to. I rarely never cook dinner, the laundry stays piled up in bedroom floors, bottles in the kitchen sink, and I can’t remember the last time I just sat with Grant and played with him for more than 10 minutes at a time. This past Labor Day weekend I was forced to sit still and Jesus began to convict me of my busy-ness. What He began to show me wasn’t pretty, and something I’m extremely ashamed of. My sole reason for writing this today is to pull away the pretty, filtered, put-together life that social media pressures us to post and instead expose the reality I’m living in. To be completely honest no single area of my life is in order right now. I spend every single day going 110 miles an hour, anxiety-ridden that I am going to forget something or not meet someone’s expectations, and then toss and turn at night dreading the next day’s to-do list. Think of a clumsy waiter carrying a tray on each hand full of dishes, and then add another one on top of his head… there is a loud, messy crash in his future… and I fear mine is heading in that very same direction. It’s heartbreaking to think that if I continue at this rate our household memories will be five minutes here or there where I could fit them into my demanding schedule. I live in constant guilt for letting down family and friends because I don’t have time for them. Guys, this is not at all what I was created for. Jesus did not die so that I might live a perfect, plugged in, box-checking life doing everything anyone asks me to do. He died so I could experience freedom and joy in this life He gave me. Right now I feel bound to so many responsibilities that I’ve agreed to in the midst of my striving to feel accomplished, connected, needed, and known—that the very freedom He died for, is a concept I can’t begin to grasp. Today I’m hoping that I’m not the only woman who has walked these shoes and that some of you might could say a prayer for this tired girl as I begin to evaluate what in my life I need to lay down. This is a challenge for someone like me who fears disappointing people, but ultimately I know Jesus wants more for me and all of these “things” are cluttering my calling. “Come on Buff you can do it, just bend your knees, throw the ball, and follow through.” It was only the twentieth time I had tried to throw that basketball over the street sign on our road, and each time it hit the sign and bounced back to me. I just couldn’t throw it high enough, and I was pretty much over the whole “basketball” thing after the third failed attempt, but my dad just stood there patiently retrieving the ball and giving it back to me. “Bend knees, throw, follow through” I recited as I prepared to throw the basketball one more time, and to my disbelief it coasted right over that sign. I immediately turned and looked at my daddy for his approval, and I will never forget the celebration that happened in our front yard the first time the ball went over the sign. Dad gave me a high five, an encouraging “I knew you could do it!”, told me how proud he was of my hard work, and I ran inside for dinner that night feeling like I had just won a WNBA championship! My daddy has always been my biggest fan. I had practiced and practiced my speech. My chest was all splotchy and I was so nervous—and he could tell. He encouraged me, told me to speak confidently into the microphone, and prayed with me for God to calm my nerves. As I stepped out onto the stage, he was in the center of the auditorium smiling and silently cheering me on. He was one of the few parents that showed up for the speeches, but he was there so I could speak directly to him and try to forget about the other people in the room. He had stayed up late with me the past few nights helping me write, edit, and practice my speech. And in that stuffy middle school auditorium, it was his presence that gave me the confidence to deliver it fearlessly. My daddy has always been present. “Wow Buff, you look beautiful” he said as I stepped out of the Sunday-school room where all of my closest friends and family had gathered to help me get dressed for my wedding. As we slowly made our way to the foyer of the church, he pulled me aside and prayed for me, for that day, and for my marriage…like we were the only ones standing there. He told me again how beautiful I looked and how proud he was of me. Right before they opened the church doors, he leaned over and whispered, “It’s not too late to back out.” Ha! 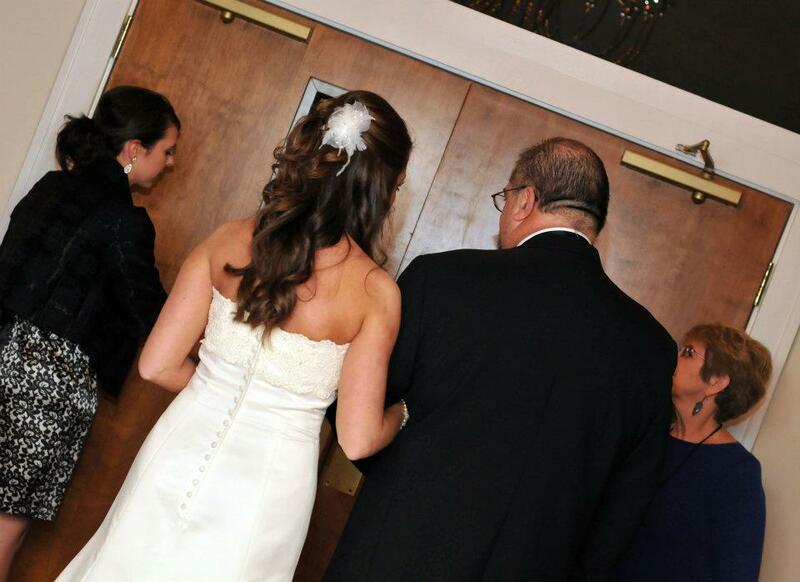 That’s my daddy, he’d support me even as a runaway bride! He knew that was exactly what I needed to unbuckle my knees and get rid of my nerves. My daddy has always been my example of love. Through all of the scraped knees, the science projects, cheerleader competitions, and every hurdle I faced, he was always there on the sidelines cheering me on. During my darkest days, he encouraged me. With every break-up, he reminded me he loved me and that God was preparing the perfect man for me. He challenged me to set high goals and work toward them, but was satisfied with just that—my effort. Good grades were important, but all he wanted was for me to try my best. Through every success and every failure he was still proud of me, just because I am his daughter. My daddy has always been approachable. The day our son was born, dad made sure they arrived at the hospital just moments after we did. With it being an adoption, no one was sure of how much access we would have and to be honest he was perfectly comfortable just sitting in the waiting room. The important thing to him was to be there to wait with us—because he knew that was what I needed. He was very guarded and uncomfortable sitting in the waiting area making small talk, and I expected that. You see my daddy was being a good father, preparing himself to be available no matter the outcome. A good father wants good things for his children, and knowing that there was a chance of celebration that morning, but also the same chance for heartbreak left my daddy very guarded—ready to adapt to my needs. When the birth mother invited my family into the room, I got to witness my daddy’s walls give way to unconditional love. I’ll never forget his face when he laid eyes on G for the very first time. Instantly, he fell in love and became “papa”—and in that moment I knew he had never been more proud of me. He was able to witness his daughter’s joy—which gave him joy. My daddy has always wanted the best for me. A good father is their child’s biggest fan. A good father is always present. A good father accepts his responsibility to teach his child what love is—through his example. A good father is always approachable. A good father always wants the best for his child. In scripture God is the example given of a perfect father and He encompasses all of these traits. My father is not perfect, but I’ve never doubted his love for me. I’ve made some bad choices in my life that hurt and disappointed him, but my daddy loved me despite those things. He never made his love and acceptance conditional to my behavior, which meant he was always available. Jesus loves you right where you are in this very moment, because you are His. Nothing you can do or achieve can make Him love or approve of you any more, and no bad choices or failure to achieve causes Him to love you any less—which means His love is always available to us. 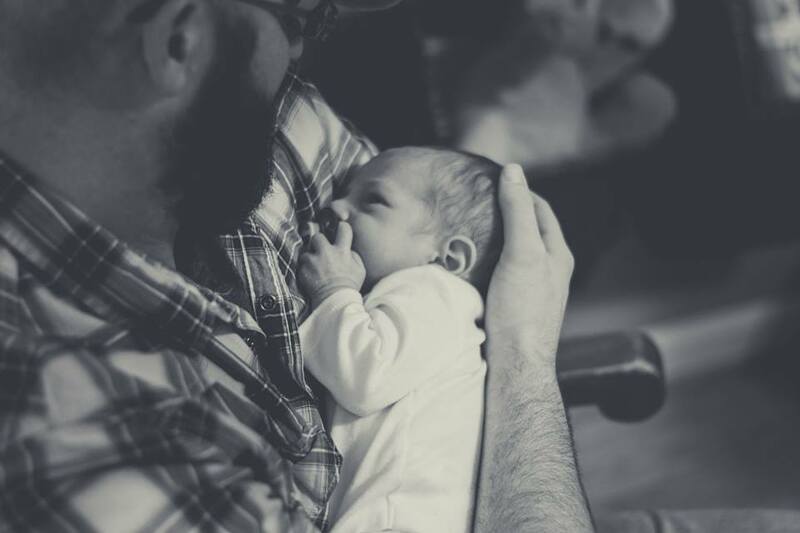 Since our son was born I have had the privilege of watching my husband become a father. Even at only 5 months old, when G learns something new he waits for Chip’s reaction, and thrives on it. It’s so fun to watch him attempt to scoot on the floor and raise up and wait for Chip to say, “big boy” or “good job” before trying again—in the same way I immediately looked to my dad the first time I threw that ball over the sign. As James Dobson put it, “It’s important for a son to succeed, but it’s far more important for a father to see his son succeed.” Watching G with Chip has shown me just how reliant we are on our Father’s love and approval—we were created needing a father’s love, so that ultimately Jesus could meet that need. There are days when Chip comes home from work exhausted, changes multiple diapers, sings silly songs, bathes, and swaddles our son. If G is having a fussy spell Chip continues in the nightly routine, while trying to soothe him. Chip never refuses to sing, play, or bathe him based on G’s behavior—because his love is not conditional. I’m sure we will face many trying days as he grows into a man but my prayer is that he learns by his father’s example in the same way that I learned from my father’s example, that Jesus loves his children despite their behavior and never limits his availability based on who we are or what we’ve done. He loves because we are His, and because He is a good, good Father. This Father’s Day, as we celebrate our earthly fathers let us be reminded of the One who provides the perfect example of what a father should be through His unconditional, unstoppable, unwavering love for His children. The moment I laid eyes on my son for the very first time I felt God’s grace in a way I had never known. His love washed over me as my love for Grant began to seep into the deepest corners of my soul. I now knew his unconditional love for me in a way I’d read about, sung about, and clung to for so many years… But that day was the first time I had felt it in such a real way. His presence was there in that delivery room as the nurses handed my son to me and our eyes met. Only 6 months after Mother’s Day. You see all week I’ve been trying to write a blog to encourage those women who are waiting and all they feel is an empty, shallow pain during Mothers Day, as they are reminded of their barren womb. I stared at my computer screen several times watching the cursor flash and the words just wouldn’t come. “But God… I want so bad to blog on my first Mother’s Day!” I prayed… Yet still no words came. He was silent. As I sat in traffic on Saturday evening, I glanced in my rearview mirror, to check on Grant, and it hit me. All of the emotions came crashing like a wave breaking… and God gave me the words. I would love to tell you to stay faithful or that His promises are true. I would love to encourage you with another blog about your waiting. But I’m not going to. I’m going to simply say what He placed on my heart tonight for the young woman facing another Mother’s Day without a baby, having to explain your tears to your husband knowing he will encourage you but never truly understand. This is for the girl who thinks secretly that God has forgotten her and tried to tell herself that maybe she just isn’t called to be a mother. Lean in and hear me whisper this and know it comes from a Father who loves you so very much. I know you’re thinking “that’s it, that’s all she’s got?” Yep that’s it… And I wanted to just shrug it off too, but God wouldn’t let me. He was persistent because He knew one of His girls out there needed to hear it. So there it is, my Mother’s Day blog, not at all how I envisioned it. Know this… I’ve been where you are. I’ve felt all of those feelings. I’ve hated Mother’s Day. But this year I look at my son’s reflection and the words that consume my heart are simply, it was worth it. I would do it all over again. I would sit through all of those Sunday sermons honoring mothers. I would bear with all the first Mother’s Day posts on social media. I would feel that empty, shallow feeling that no one understood what I was going through again and again, if it meant I could experience the love I’ve known the past 6 months. And the more encouraging reminder today is that Jesus would too. He would do it all over again if it meant the same results. For Him, it was worth it too. Trust Him. Lean into Him. Let Him fill your void until He’s ready to give you a child. I couldn’t imagine a more beautiful love story He could’ve written for our family in His very perfect timing. Jesus hasn’t forgotten you. He’s heard your prayers. And He IS faithful. 4 months—that is how long I’ve known you, but I’ve known the promise of you my whole life. When I looked down at my very first baby doll I felt the want for you for the first time, though I didn’t understand it completely. With every boy I dated I secretly imagined the kind of daddy he would be for you, and sometimes that is the very thing that made me realize he wasn’t the one for you and me. The day your daddy got down on one knee and asked me to marry him I said yes because I loved him and wanted to spend the rest of my life with him—but I also said yes for you, because I knew he would be such a great daddy! The next few years passed by and my want grew stronger. Sometimes I would catch a glimpse of what our life would be like if you were there… visiting with my aunt Jill and watching daddy rough-house with her boys, and his patience each time he had just sat down and was called to play again. The teachable moments he created with every kid he interacted with. Each time a baby was sat next to us at a restaurant, your daddy would go out of his way to make funny faces and then encourage the mommy and daddy by telling them how precious their gift of parenthood was. Those were the days I started to see his want for you. That rainy day the doctor told us you were impossible was the day I felt my heart break into a million little pieces. I ran out of the office and your daddy was right behind me. He hugged me tight and reminded me that Jesus is faithful and that He would give us you in His timing. We both cried and that’s when I saw daddy’s want was just as big as mine. February 17, 2014 (mommy’s 26th birthday) was the day Daddy and I announced to the world that we believed God’s promises to us were true and that He would give us you. We stepped out in faith and claimed the calling He gave us to adopt and started praying for the special woman who’s tummy you would grow in. Our want was multiplied on that day. Those next nine months were the longest months ever for mommy and daddy as we pursued, waited, and prepared to meet you. Your whole family was so excited, but none of them could begin to imagine just how big my want for you was. November 10, 2014 at 3:30 in the morning we got a phone call that you were on your way. So your Daddy and I jumped in the car and drove to the hospital, anticipating meeting you the whole way. We spent the next few hours dreaming about what you would be like and couldn’t believe how close we were to meeting you. At 1:23pm the nurse placed you in my arms and instantly my heart was put together again. That want for you I had known since I was a little girl was met with a peace that only Jesus can give and a full heart unlike I had ever felt. The moment my eyes met yours I knew Jesus had created you perfectly for me and daddy. All of those years of waiting were so worth it when I saw your little smile for the very first time. And watching your Daddy light up as you wrapped your tiny hand around his finger was magical… nothing can describe the love we had for you in that moment. I share this story with you because there will be days in your life that you feel a strong want, something deep inside of you that you won’t quite understand at the time. That want will grow stronger and stronger with time, and there will be a stormy day where that want will feel impossible. When that day comes, know that mommy and daddy have both felt that hopelessness that drowns a want or shatters it into a million little pieces, and we will be there to hug you tight and remind you that Jesus is faithful. Hear me son when I tell you that Jesus IS a promise maker and a promise keeper and He will give you that want, but before He does He will grow you in ways you cannot imagine. He will write a beautiful story through that want and then use it to encourage other people’s wants. And one day, when you least expect it, after months or maybe even years of Jesus preparing you… He will provide your want. And you, too, will feel that peace we felt when God gave us you. My prayer for you is that you will grow up never doubting Jesus loves you and how His want is immeasurably more for your life than you could ever dream or imagine. That you know the love your daddy and I have for you and that we wanted you so so much. That you will understand the impact your story has already had on so many, and that you will continue using it to glorify God in such a way that no one can deny His hand on your life. Your life is an example of how faithful our God is and that He keeps His promises. I love you my little one and always will. Becoming a mother has always been a dream of mine. Since Jesus answered that prayer on November 10th, I have never felt more full of love! It’s so true that The Lord wants His children to experience joy “to the fullest” and I know firsthand He gave me my little G to glorify Him with that abundant joy. The thing is, while motherhood has been the most rewarding thing I’ve ever experienced, it has also been the hardest thing I’ve ever had to do. Becoming a mother has taught me selflessness in a way I’ve never known. I’ve had to set aside food, rest, showers—yeah even showers. Yet I can’t wait to wake up again each day and do it all over again, all for the look my son gives me as I watch the corners of his beautiful mouth stretch into the biggest smile I’ve ever seen. And I can’t help but think… what a perfect picture of God’s love for us. He gave the ultimate sacrifice for our sin, and yet He can’t wait to shower us with blessings just so He can watch our cups overflow with joy. During my short time of being a mom, I have discovered one not-so-sweet thing that I think all mom’s have experienced a time or two… and that’s the standards of motherhood us girls use to measure our worth. For those of you who don’t already know, our son was born with a cleft lip and had been back and forth to appointments with our plastic surgeon leading up to his cleft lip repair surgery. At our first appointment as we were waiting to get on the elevator, a woman stopped to ooh and ahh over G and how adorable he is. As she started toward the door she spoke up and said, “you are so lucky you lost the weight that fast! It took me months to get back into jeans and I still don’t look that good!” As I bit my lip to keep from letting the first response that came to my mind slip out, it hit me that there are way to many women out there who focus more on what society deems important than on our calling to motherhood. My intent here is not to throw off on her not being sensitive to the fact that I did not birth my son physically… because 1. she had no way of knowing and 2. I don’t want my son’s life to be defined by his adoption… he is ours and we are his. The thing that really breaks my heart is that instead of uplifting each other as women we are constantly reminding each other of our inadequacies. Even if I had carried G 9 months inside of my womb and delivered him, walking away with stretch marks and a body that was shaped differently because of it and being critical of that body or complimenting someone else’s lack of physical changes is not what Jesus wants us focusing on. As Pinterest, Facebook, Instagram, and other social media outlets continue to grow in popularity, our idea of perfection blur the lines of reality and cause us to form ridiculous expectations of what today’s mother should look like. What if we start celebrating what the Lord has called us to, instead of hyper-focusing on what the world has? What if mothers start encouraging each other instead of playing the comparison game. What if we refused to give into the “perfect mom” complex and instead embraced our lack of perfection and the beauty of our need for Jesus to mold us into the mother He wants us to be—as opposed to the mother we want to be. Comparison is a slippery slope friends and I believe Jesus wants more for us as mothers, or mothers-to-be. So thankful for all of the friendships I’ve made throughout our adoption and infertility journey, especially the ones made via social media who I’ve never actually met but feel like I’ve known forever. Jesus has used each of you to encourage, challenge, and inspire me along the way! I was so blown away when my sweet friend Libby Wendland asked me to be a part of a blog series she was doing over on her website. I’ve really enjoyed reading all of the posts in ‪#‎thedawnisbreaking‬ series, and I know you will too! Also, take a moment to pray for the Wendland’s as they wait to bring home their sweet Eden. Her friendship has really been a blessing and I cannot wait to watch as Jesus brings their sweet family together. One year ago we received the most devastating news… that we could not conceive naturally. One year ago I drove out of the parking lot of that doctor’s office feeling a hopeless, aching pain like nothing I’ve ever felt. That ten minute drive to work felt like it took a year and I don’t think I’ve cried that hard in my entire life. I remember that night Chip held me and repeatedly told me he loved me. I remember my very raw and angry prayer to God asking why He wanted me to experience so much pain. Thanksgiving was the hardest… two of my cousins brought in their new babies and I felt such a desire to hold and cuddle them… in a weird way it brought me peace I had not been able to feel in days. It was that weekend God first put a burden in our hearts that eventually led to our calling to adopt. Little did I know that exactly one year later I would be preparing to bundle my son up and bring him to our family’s Thanksgiving dinner. Chip and I are also celebrating our fourth wedding anniversary and in this past year I have never felt closer to him. The Lord has used our waiting period to strengthen our marriage and teach us how to love each other despite difficult days. Those lessons have proved already to be valuable ones and I can’t begin to tell you how full my heart is as I look back on this past year. If I could offer anything it would be that I don’t know your current struggle, I’m not sure what battle you’re preparing to face or what pain you’re dealing with… but I do know that our Lord does not allow us to go through difficult days unless He is preparing us for something bigger, something better than we could ever dream up ourselves. This Thanksgiving I have so much to be thankful for. We have been abundantly blessed and I will never forget everything Jesus has done for us this year. I know there are people out there who are struggling this year with pain, I would encourage you to keep trusting Jesus because you never know what blessing He has planned for you this year. I feel like we all struggle with finding our identity at times. It’s a popular issue among teens battling the “Who am I” and “What makes me different from everyone else” questions. But I would venture to say that I’m not the only woman who has had those days where I feel my inner-fifteen year old scream those same questions. Most of the time those days are also the days where I’m struggling with my purpose and trying to figure out if I’m making a difference. The cloudy days where I’m a little more willing to pay a ridiculous price for that cute planner I’ve been eying because lets face it, if I was just more organized my life would make so much more sense. The truth is I’ve really been searching for my purpose over the last few weeks. Two weeks ago I was in a bad car accident. I walked away without a scratch, yet the other driver didn’t make it. I’ve found myself asking God so many questions, but the biggest has been why—both old why’s and new why’s. Why am I still here and the other guy isn’t? Why I was so close to paying my car off and now am faced with finding another one? Why is it taking so long to be matched with a birth mother? Why don’t I have a baby yet? I’ve been so confused as to why He hasn’t answered me or given me any valid signs that would help me answer those questions. I’ve been growing more and more impatient and more and more uncomfortable. Then Sunday came… and in the midst of our church’s series on money, our pastor delivered a message I will never forget. It was a message about surrender, and was from 1 Kings 18:30-35. In the scripture, God brought Elijah and the Jewish people to the point of desperation so He could show them who He is and what He is capable of. Our pastor reminded us that God always hears the cries of desperate people. He also mentioned that sometimes we pray for God to reveal His power, when we should be crying out for God to pour out His grace. That struck a nerve. How many times had I prayed in the past week for God to just reveal His power and do something miraculous in my life to show me my life had meaning. The main point of our pastor’s message is the point that I would like to encourage you with today… Surrender is not when we give God something, it’s when we give God everything. I’ve been holding onto my desires and my dreams for so long that I haven’t even realized I was still holding on to them. Sunday, I was reminded that God’s purpose for my life is daily surrender. I don’t have to know exactly what God wants for my future, I just have to know that I’m surrendered completely to whatever that future holds. I don’t have to know why the wreck happened, I just have to be surrendered to the fact that Jesus has full control and wants me here today for a purpose. And as far as that purpose goes, I don’t have to know what it is… I just have to surrender my day to Him and my purpose is then found in Him. This isn’t a big 7 step guide to finding your purpose, it’s a 1 step guide. Friends, surrender is not when we give something, it’s when we give God everything. The Jewish people who gave their water eventually got so much more water in return. When we surrender everything, we get more than we had in the first place. Through our surrender, we find our purpose and identity in Christ. I’m not sure who is reading this who is feeling frustrated about not being where we feel we should be as far as our ministry or calling, but just rest in the fact that you are exactly where you’re supposed to be in this moment. Jesus wants to use “our water” to one day bring “the rain”. I try and stay in touch with my readers on a personal level through social media. Share this post to pass it on, and then click here to find me on Facebook.